It’s not easy being Santa Claus. Packaging and shipping all those products, keeping everything in stock across a massive warehouse, coordinating complex supply chains, making sure everyone gets the right gift on time…Things at the North Pole sound a lot like what online sellers go through during this time of year. If your e-commerce business is like most, you’re currently getting ready for the Q4 rush, preparing yourself mentally and financially to meet heightened consumer demand and outperform your competitors. It’s an exciting time—you have the opportunity to take your successful business to the next level—but also an extraordinarily stressful one. Long nights, logistical challenges, and perhaps a few nog binges lie ahead. But before you accept the stress-induced white beard and extra pounds, remember: even Saint Nick doesn’t do it alone. He has elves to take care of the details and ensure the workshop runs smoothly. And as an e-commerce seller, you can have the next best thing: SellerActive’s repricing technology. Repricing follows a predetermined pricing strategy to adjust your inventory prices instantly and automatically. 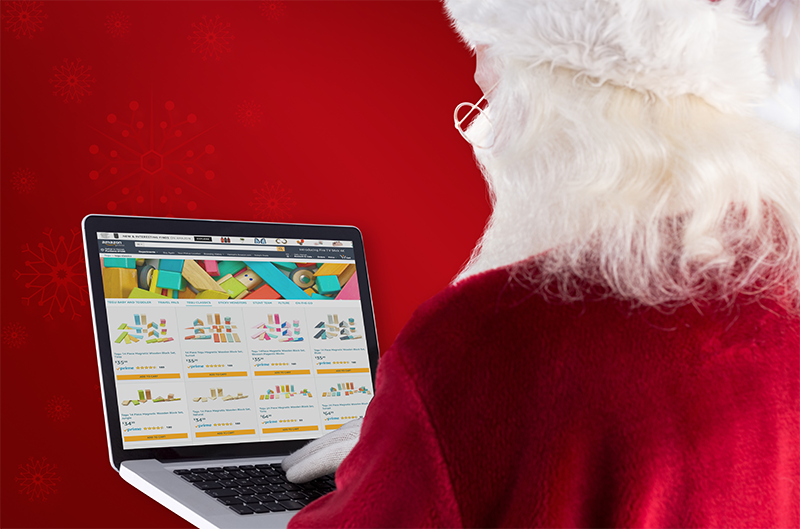 Like Santa’s elves, it works around the clock to keep your products moving and your business humming. It’s a smart, cost-effective way to gain a competitive edge during the holidays—without hiring additional employees or disrupting your existing operations. In fact, sellers who use repricing during the holidays are able to capture, on average, 78% of Buy Boxes; a crucial business advantage when it comes to moving more units. Best of all, with SellerActive, repricing takes only a few minutes to set up. Not sure if repricing is right for you? Here are seven more reasons why automated repricing software is good for business this holiday season. That’s right: from October through December, FBA storage fees increase by more than double. That means it’s more important than ever to sell your FBA inventory as fast as possible. No business can afford to allow stock to stagnate. With smart, automated repricing, you’ll offset the cost of storage fees. How? By maximizing your chances of winning the Buy Box while optimizing margins on every sale. Automated repricing is the only way to make sure you’re selling for the highest possible Buy Box price, every time. But the solution you use matters: Amazon’s Automated Pricing tool, for instance, simply continues to lower prices, failing to re-adjust upwards. SellerActive’s repricing capabilities automatically raise your prices when competition subsides. As a result, you’ll not only increase your chances of a sale but keep your margins intact—a must during the holiday season. Of course, the more marketplaces you list on, the more potential customers you have. But did you know that consumers who shop on more than one channel spend three times as much as single-channel shoppers? Or that multichannel/omnichannel e-commerce businesses are 91% more likely to retain customers? Clearly, a multichannel approach has multidimensional benefits. During high traffic holiday sales events, however, keeping listings synchronized across channels can cause multiple headaches. That’s where repricing comes in. By using ecommerce repricing software like SellerActive, you can be sure your products stay competitively and equitably priced wherever you do business. Even if you have little or no competition, repricing can make a major difference during the holidays. With velocity-based repricing, private label sellers can a) get slow-moving products out the door and b) ensure the value of high-demand products correlates to supply. Whether you have minimums or maximums in mind, SellerActive’s velocity-based repricing algorithm is built to help you sell a specified number of products in a specified period of time. On top of that, we can increase website sales conversions with real-time marketplace price mirroring. As we’ve written before, repricing is all about speed. SellerActive’s automated technology updates prices every 46 seconds—much, much faster than a human would be able to manually. And like Santa’s elves, we work non-stop: 24 hours, day and night. The holidays may be a hectic time for e-commerce sellers, but you don’t need to sacrifice your business strategy (or your sanity) to succeed over the next few months. Go beyond simply raising and lowering your prices in response to competition. Through rule-based repricing, you have the power to undercut other sellers through rules you determine and set in advance. It’s the difference between merely reacting to holiday pressure and soaring above it—sleighing the competition, if you will. SellerActive Repricing Plans Are on Sale! If you're ready to try automated repricing, but need a little extra jingle to seal the deal, here's a little gift from us to you. 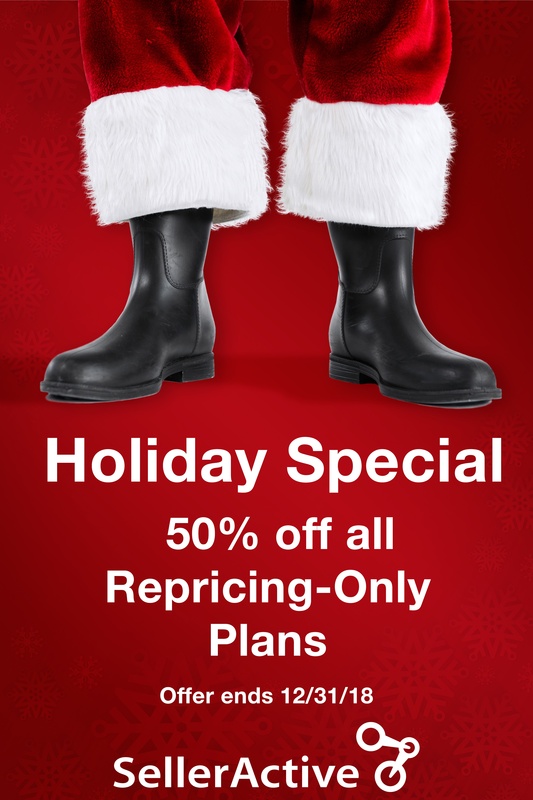 For this holiday season only, SellerActive repricing-only plans are 50% off! To get started, book a demo below, or email us at sales@selleractive.com.